Apple sold fewer iPhones than expected in its most recent quarter but their higher price tag meant the tech giant still beat analyst forecasts. 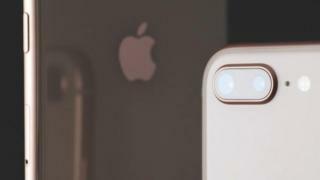 The firm said its £999 iPhone X – launched last year – remained its most popular iPhone model in the quarter and had driven the higher selling prices. Strong revenue growth of 31% from Apple's services business, which includes the App store and Apple Pay, also boosted its performance. Overall the tech giant's revenue jumped 17% year-on-year to $53.3bn (£40.6bn), with every region except Japan reporting double digit gains. The firm reported profit of $11.5bn, up 32% compared to the same period in 2017. Shares in the Californian tech giant jumped more than 2% in after hours trading in New York.